At a Beltane celebration over the weekend I got talking with some witchy friends about traditional May Day songs. One we remembered was In and Out the Dusty Bluebells, but we all had slightly different versions of the words. The three lines repeat "In and out the dusty bluebells". I recalled the last line of the first verse being "You will be my partner" but other versions seem to be "I will be your master", "You are my master" or even "My fair lady". The second verse starts with three lines of either "Tippy tippy tap toe on your shoulder" or "Give a little pit-pat on her shoulder" and then the same variations for the last line of the second verse as for the first verse. We all remembered there was a dance that went with it, in which people stand in a circle while one person skips in and out between them for the first verse, then stands behind one person patting on their shoulder while singing the second verse. The first verse is repeated with both people holding hands and skipping in and out of the circle, picking a third person to join in, then a fourth and so on until everyone is dancing. None of us could remember what the origins of the song were supposed to be, so, back at home I did some web searching. It seems one idea is that the song originates from the 1900s (or perhaps a little earlier) and refers to May hiring fairs when young people were selected by farmers to work for the summer. It was a time that bluebells were flowering, hence the dusty bluebells, and the reference to choosing a master was about gaining employment. I must admit I'd hoped the origins were a bit more romantic than that. 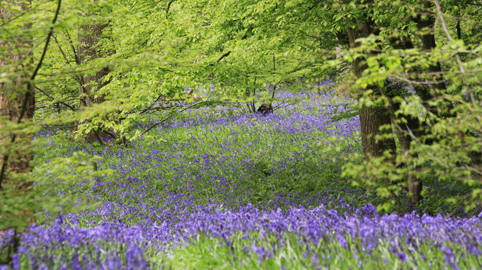 But whatever it might have meant in the past, nowadays the song seems to be more about celebrating the start of May, the beauty of the bluebells and a little nostalgia for times gone by.